Frances Roberta Henderson Owens, 88, of Stamping Ground, Kentucky died Tuesday November 20, 2018 at Dover Manor Nursing Home. Frances was born July 1, 1930 in Stamping Ground, Kentucky. 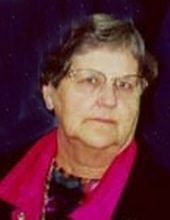 Daughter of Robert & Mamie Aiken Henderson. Married to John Chester Owens at the age of 15. Through rain, sleet, and snow Frances would make her way to work every day at John Graves Ford Memorial Hospital, dietary department, to help support her family. Frances had many health problems over the last ten years which kept her from enjoying spending time with her family. Beloved mother, grandmother, great grandmother, great great grandmother and sister. Sister: Edna May Henderson Bramlett, numerous nieces and nephews. Proceeded in death: Husband, John Chester Owens, Son, Donald Reed Owens, Daughter-in-law: Yolanda Zarate Owens, Brothers, William and Robert Henderson, Sister, Margaret Henderson Grimes. To send flowers or a remembrance gift to the family of Frances Roberta Henderson Owens, please visit our Tribute Store. "Email Address" would like to share the life celebration of Frances Roberta Henderson Owens. Click on the "link" to go to share a favorite memory or leave a condolence message for the family.